I am sometimes asked why did you stand as a councillor? The answer can be very simple, “Because I was asked to”. However, there is obviously more to it than that. Having taught for 34 years at Hawick High School I was approaching retirement and wrote to the Department of Works and Pensions to apply for my State Pension. The reply shocked and outraged me as I was informed that I would have to wait a further six years for my State Pension. I had paid into a system for 40 years and the contract was being ripped up by the government. 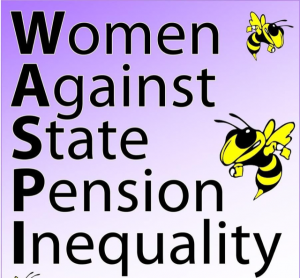 I started to contact other women who found themselves in the same position as myself and as a consequence I became co-coordinator of the Scottish Borders WASPI group, Women Against State Pension Inequality. This has brought together thousands of women from across Britain affected by these changes and many are living in extreme hardship. These women worked hard, raised families and paid their tax and national insurance with the expectation that they would be financially secure when reaching sixty. It is not the pension age itself that is in dispute. It is widely accepted that women and men should retire at the same time. The issue is that the rise in the women’s state pension age has been too rapid and has happened without sufficient, or in most cases any, notice being given to the women affected, leaving women with no time to make alternative arrangements. I started to receive letters from ladies in our region telling me about the difficult situations that they were living in. Their retirement plans shattered with devastating consequences. Many of these ladies are already out of the labour market, caring for elderly relatives, providing childcare for grandchildren, or suffering discrimination in the workplace in a struggle to find employment. They may even be told to apply for job seekers allowance, which offers a six week reprieve. The most recent slap in the face was the Pensions Minister, Guy Oppenheim, who suggested that the women affected could apply for apprenticeships until they reached their new retirement date. I contacted our local MSP at the time (now current MP John Lamont) to be told that it was a Westminster policy and he could not get involved, but to contact Roz Altmann who was the Pension Minister at the time. He further commented that we had however been dropped off a cliff, as far as the State Pension was concerned. Dr Altmann’s reply to my enquiry was very interesting as she accused me of not informing the DWP of a change in address and that women had been given plenty of warning. I have been at the same address for twenty seven years and have received other notifications from the DWP. So go figure! This is when I became more politically aware and very angry. At this time Boris Johnson was wanting to spend billions on his vanity project – a garden bridge across the Thames, “which would be good for Britain” said Joanna Lumley, a project that has since been dropped at a cost of £45million to us the tax payers. A fast train through Birmingham to London, a luxury £44,000 bathroom for Jeremy Hunt, to say nothing of Trident or £3billion on a new aircraft carrier, with no aircraft etc. and suddenly I could see what my pension was going to be spent on. I then approached my then MP, Calum Kerr, who wholeheartedly supported the WASPI ladies plight. 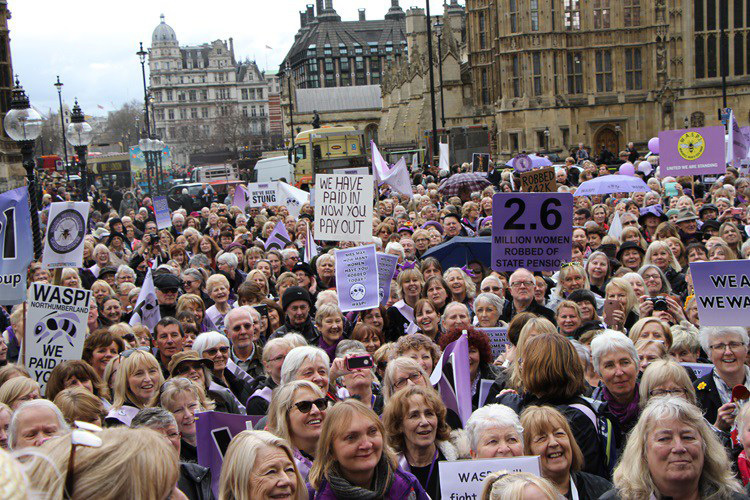 He brought us together with 7000 other women to Westminster, in order to demonstrate against this policy. As a result a cross group of MPs was set up; including many Tory backbenchers. I continued to write letters of complaint to the DWP, Theresa May, George Osborne and my MSP and I continued to get back benign letters of platitude. I set up a couple of petition signing sessions at Morrisons in Hawick to let ladies know that they were not alone dealing with this issue. 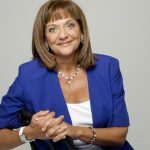 Roz Altmann then resigned her post as Pension Secretary and announced that in fact the women born in the 50s had been treated unfairly but that she couldn’t say anything as her “hands had been tied by Ian Duncan Smith”. It was around this time that I was asked if I would stand as a councillor, and inspired by Angela Davis “to no longer accept the things I cannot change but to change the things I cannot accept,” I decided I would like to be involved in local politics. I started to knock on doors and talk to people about various issues, one being the State Pension crisis. I came across some ladies who were quite happy as they were getting their Pension and did not want to support their fellow ladies who were not, some even expressed the view that the Scottish Parliament should mitigate the changes to State Pensions, another said to me ‘hard cheese ᾽cause I get mine’. We seem to be living in a society where ‘ I’m alright Jock’ seems to be the views of a few. Margaret Thatcher is quoted as saying ‘there is no such thing as a society’. That is not a world that I want my children or grandchildren to inherit. Our new MP, John Lamont, stated, at one of the recent General Election hustings, that it was his intent to support ‘people over policy’. I contacted him when he was elected to garner support and his reply shocked and again angered me. “I will not go against my Government”. He then stated that he has been giving the WASPI ladies, in his constituency, support. I asked him in what way and his reply was, “I ask them to lobby the Scottish Parliament”. He obviously doesn’t understand that this is a a reserved Westminster policy that cannot be mitigated by the Scottish Government. The only relief that the Scottish Government can offer is Job Seekers allowance for six weeks! I am fed up with the lies that are continually peddled. Our MPs should be supporting their constituents and understand that 5000 ladies in this constituency [Berwickshire Roxburgh and Selkirk] will be watching with bated breath. Clair has organised a meeting for WASPI ladies in the Scottish Borders on Sunday 11th February,10.30am – 12.30pm at the Sprouston Room, Newtown Community Wing, Newtown St Boswells. If this draconian policy affects you or someone you know please come along. 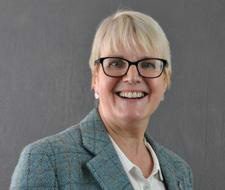 This article first appeared in Border Patrol and is published on Newsnet thanks to the agreement of Councillor Clair Ramage and Dorothy Bruce, Editor of Border Patrol. A full copy of this issue of Border Patrol can be downloaded at http://www.snpberwickshire.scot/2018/02/border-patrol-12/ You can sign up to receive future issues by registering on the website.